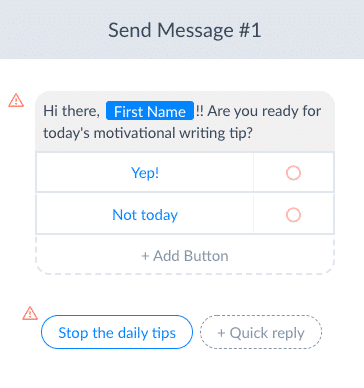 Wonder how services like Shine Text and so many others are able to write up and send out daily tips via their messenger bot? 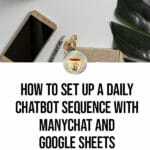 It’s not as hard or as time consuming as you might think to set up a daily chatbot sequence with ManyChat. And if you throw Google Sheets into the mix? It becomes even easier. 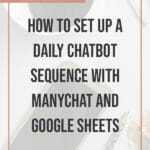 In this post, I am going to show you how to use the new Google Sheets integration to set up a daily chatbot sequence with ManyChat without Zapier. 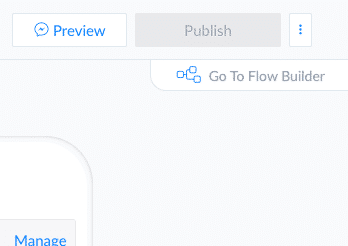 That’s right: no Zapier, no IFTTT, no Integromat…no third-party integrations at all. 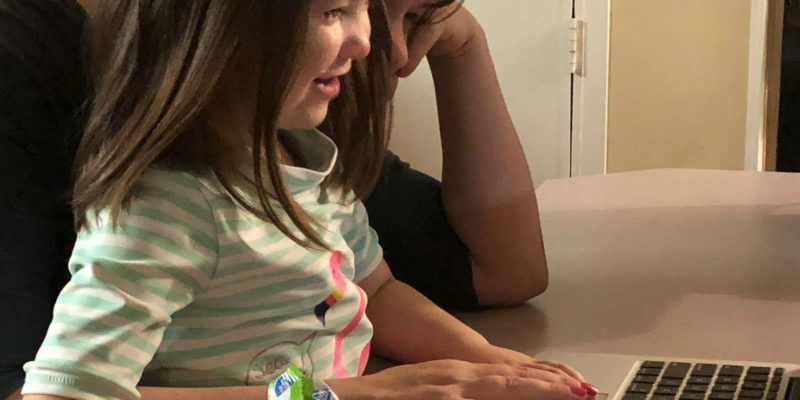 Just ManyChat, Google Sheets, and a little bit of your own magic. 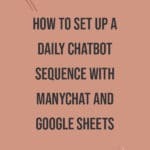 So, ready to turn your tips of the day, quotes of the day, daily motivation, or whatever your audience is after into a chatbot sequence with ManyChat? (PSST, if you’re short on time and would rather just install a prebuilt template, we can do that too!! You can purchase this entire template, complete with a ready-to-use growth tool opt-in, for just $45. Just install, add your own Google Sheet with quotes, and you’re ready to go!)! Are you enjoying this article? Take a minute to PIN it! You never know when you might need these tips again. Why Use a ManyChat Sequence? Working from home as a freelance writer is awesome, am I right? I mean, what can be better than getting to do something you love and getting paid to do it? But there is that one, teensy-weensy drawback — working from home almost always means working alone. And having to do it all. The marketing, the promoting, the planning, the talking to people on social media. 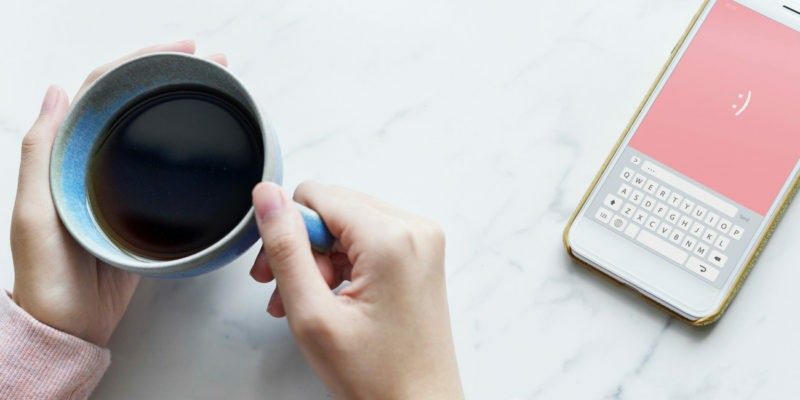 And if you’re already trying to juggle your writing projects, finding new clients, and your clients’ projects, then adding in content for social media engagement may just push your calendar over the edge. Setting up a sequence can help by allowing you to batch-write multiple messages and get them scheduled to send out on time and consistently without adding yet another burden to your shoulders. Because talking to your audience should never be a burden. Set up your Google Sheet. Give ManyChat permissions to access your Google account. Set up your Custom User Field in ManyChat. Set up your Sequence in ManyChat. 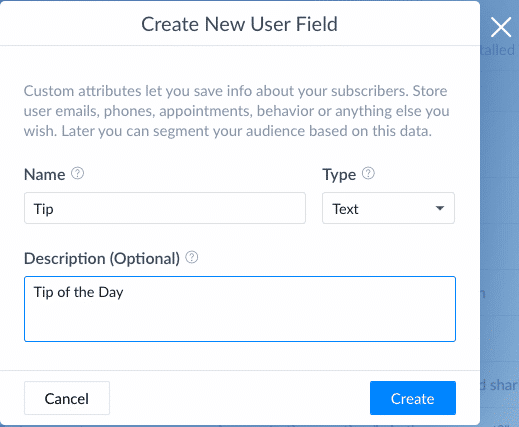 Set up the Growth Tool so people can opt-in to your daily sequence. I love using spreadsheets for things like tips because they are so easy to use. Be sure to name your spreadsheet something that will be easy to remember. 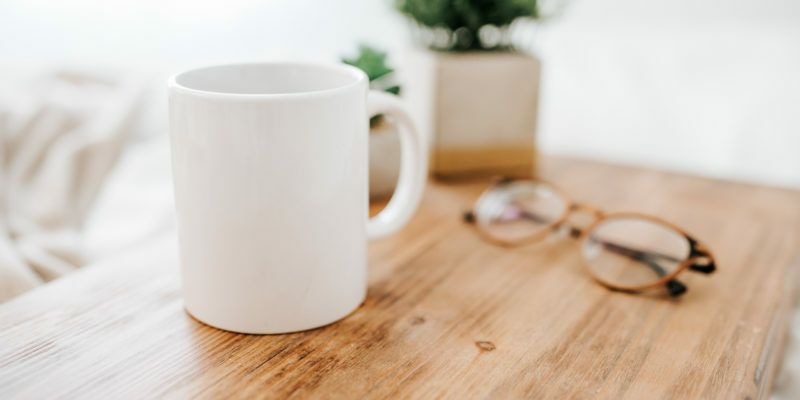 Simply gather your tips, quotes, scriptures, or whatever else you plan on sending out every day and arranging them in the spreadsheet. One quote per line. Be careful not to add in any time-sensitive tips. As you’ll see later, no one will be running through the sequence at the same time, which means no one will be receiving the same message at the same time. If you try to add in a holiday special or a coupon code that is only going to be available for a short time, chances are most of your subscribers won’t receive it in time. Keep the content evergreen, and you won’t run into any issues. With that done, time to move on to the next step. Obviously, if you want ManyChat to read your Google Sheet, then we need to give it permission to do so. Go ahead and click on the button to connect your Google Sheets account. On the next screen, Google will ask you to log in (if you aren’t already logged in) and will then ask you to confirm granting ManyChat permissions. Don’t worry. I know how scary it can feel with everything always wanting permissions to see everything. 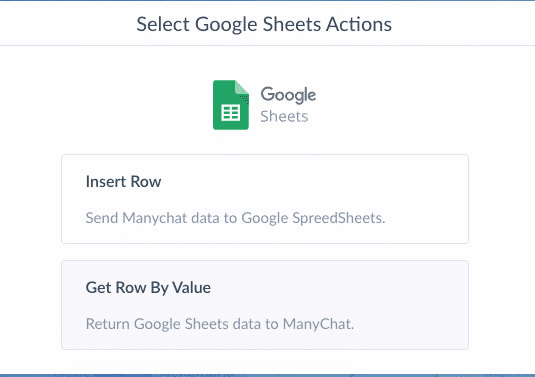 In this case, ManyChat is only asking for permission to view and write to Google Sheets for you – nothing else. You’re not signing away your entire Google account or even allowing it to read your email. 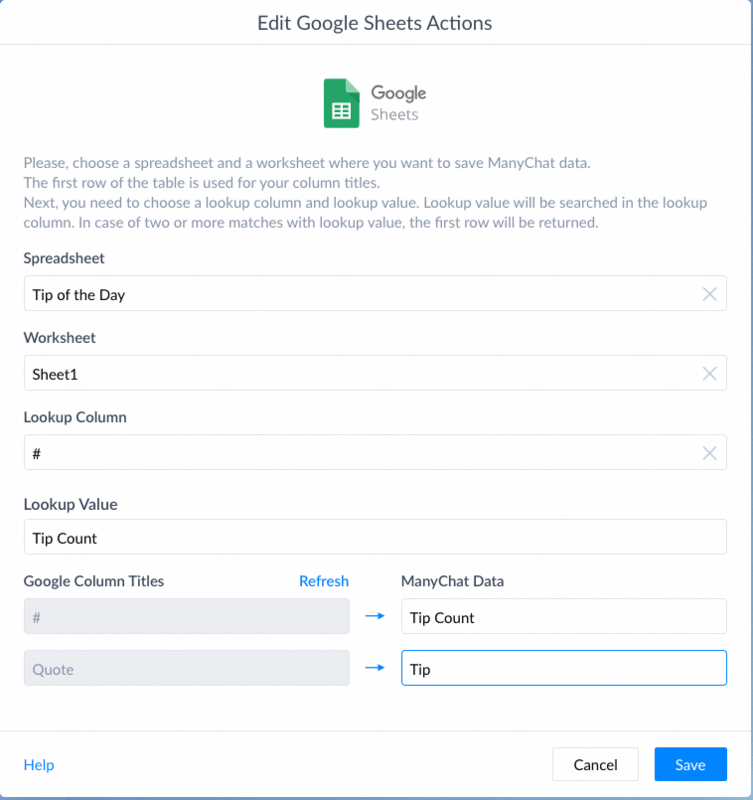 Now that ManyChat has permission to access and view your Google Sheets, let’s tell it how to use the information in there. Click on the button to create a new user field, and then fill in your information in the popup that comes up. What you name the field really isn’t all that important, as long as it is unique (and should be something you recognize and can remember, especially if you’re like me and have a lot of them). You can also fill out the description if you want, although that’s not really required. The most important field to remember here is that under Type you must choose Text. With your custom field in place, it’s time to move on to the next step. 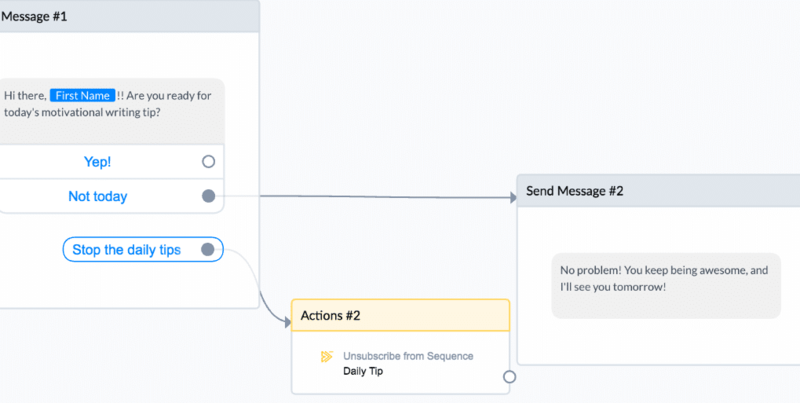 Once you’ve created the sequence, ManyChat will let you know that you don’t have any messages in that sequence, and it will invite you to start writing your messages. That brings you to the normal sequence screen. Now, typically in this step, this is when you would start writing up a new message for every day. 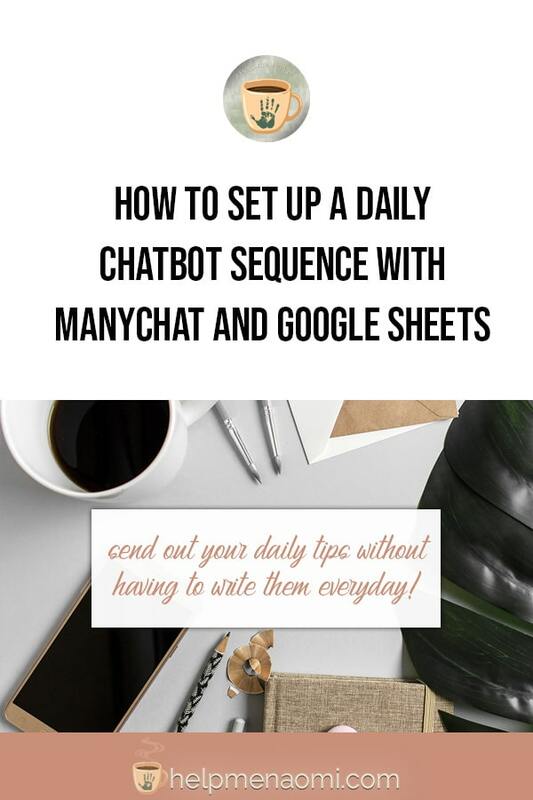 But for something like a tip of the day or any other daily chatbot sequence with ManyChat, that would just be too time consuming. So we are just going to work with one message and use it to send out a new tip from our spreadsheet every day. 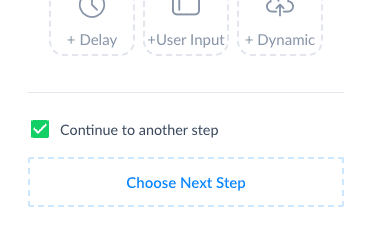 Once that’s done, go ahead and click on the Actions box to to open up the sidebar so we can tell it what we want it to do. What this field is actually counting is how many times a user has gone through this sequence we’re setting up. So, the first time, it will send them the first message. The second time, the sequence will send them the second message. And so forth. Now, the next thing we want to do is make sure that every time someone goes through this sequence, the tip count increases by one — we don’t want them missing or skipping any of those tips!! The next step is going to sound a little funny, but bear with me here. 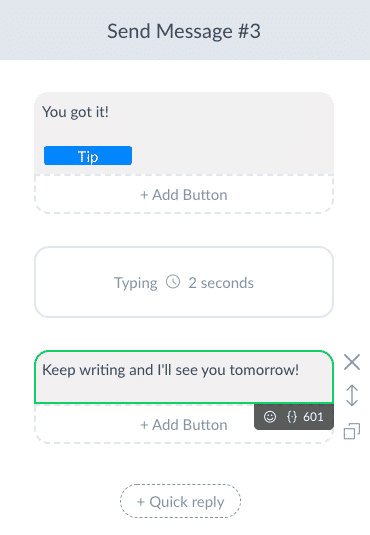 Now, this next part is one of the most important steps of this whole process (and the very reason people get onto social media in the first place): inviting your audience to engage with you and your chatbot by asking if they are ready to get the day’s tip or quote. This is important for a few reasons. First of all, it’s really just nice to feel heard. So, if someone doesn’t want the tip that day for whatever reason, giving them the option to skip it that day is just a nice thing to do. It shows that you respect their time. Second, it keeps your audience engaging with your page’s messenger — even if it is just clicking a button on a chatbot instead of sending a new message. And that’s what we want: we want your audience to engage with your page. Besides, it you just sent out tip after tip after tip or quote after quote after quote without any chance for engagement, that would get really stale after a while — even if they are different every day. Jokes of the day always seem like a good idea until you get them every day for a few weeks. So, we’ll start from the bottom. 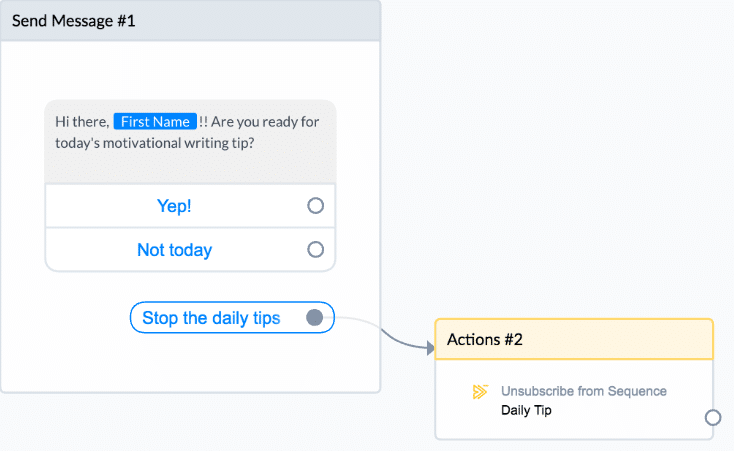 We want to use a Quick Reply for the option to stop the daily tips because we don’t want anyone to accidentally unsubscribe from your entire bot if they only want to stop receiving your daily chatbot sequence. Plus, this makes it really easy for your audience — and no one wants to have to jump through hoops to opt out of something. So that one is easy: set it to perform an action and unsubscribe from the sequence. And the second option is pretty easy, too. If someone selects that they aren’t ready today, then just respond with a message that you’ll see them again tomorrow. This way, it serves as a reminder that they’ll receive a new message again tomorrow. Now for that Yes option. The name of the spreadsheet. Which sheet in that spreadsheet to look at (the default is Sheet 1). “Lookup Column” should be the one with your numbers or count. “Lookup Value” is where you will look up the Tip Count number user field you created earlier in this step. 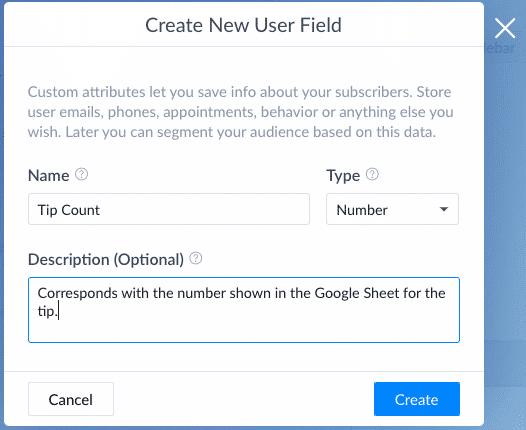 Map your Google Data to your ManyChat fields: # (Column A) will be your Tip Count, and Quote (Column B) will be your Tip custom field you created in Step One. Once you click on save, it’s time to let ManyChat know what to do with all the data it just pulled in. And that means setting up the actual message that will be getting sent out with the quote. In this message, I like to keep things short and sweet. A quick acknowledgement letting them know that this is their tip of the day, the tip itself (set by using the personalization feature and then selecting the Tip custom text field we set up in step one) and then a quick note letting them know that they’ll be receiving a new message from me tomorrow. 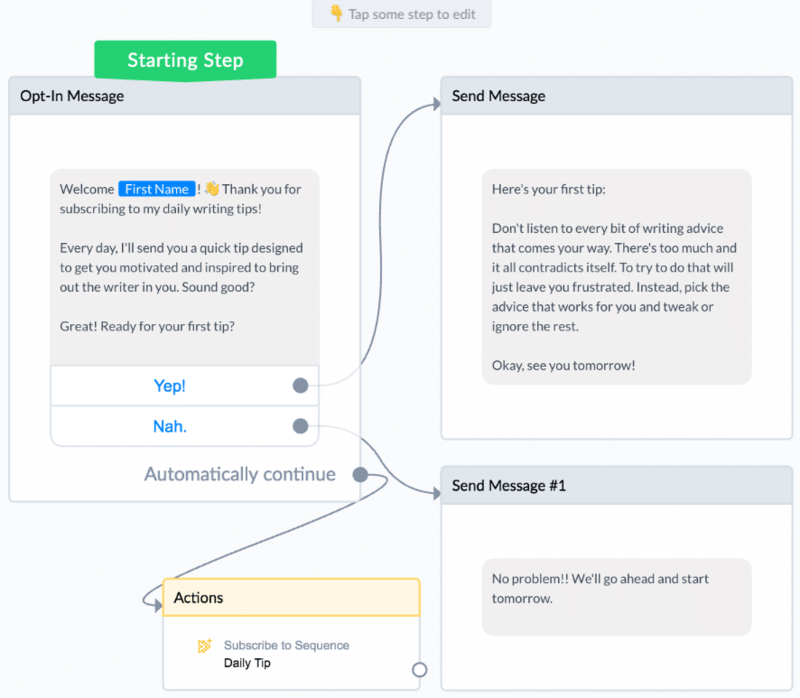 Once you’re happy with your messages, go ahead and publish the sequence to make it live. Don’t forget to go back into sequences and activate it as well. 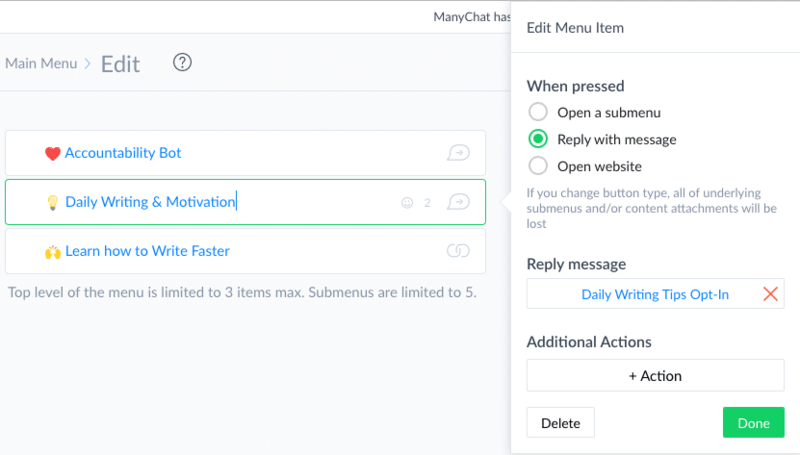 Now all that’s left to do is to allow people to actually opt-in to your new daily chatbot sequence with ManyChat growth tools. 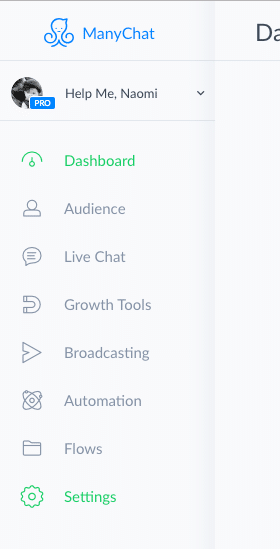 A Growth Tool in ManyChat is just that: a tool used specifically to grow your subscriber list. Now, in this case it works to offer them the first tip right away because my sequence is actually set to start one day after they’ve been subscribed. So this way, they aren’t getting bombarded with things right away, but they also aren’t opting in to the daily tips only to then wonder what’s going on because the first one isn’t sent yet. Finally, Continue to update your Google Sheet to keep the sequence going. 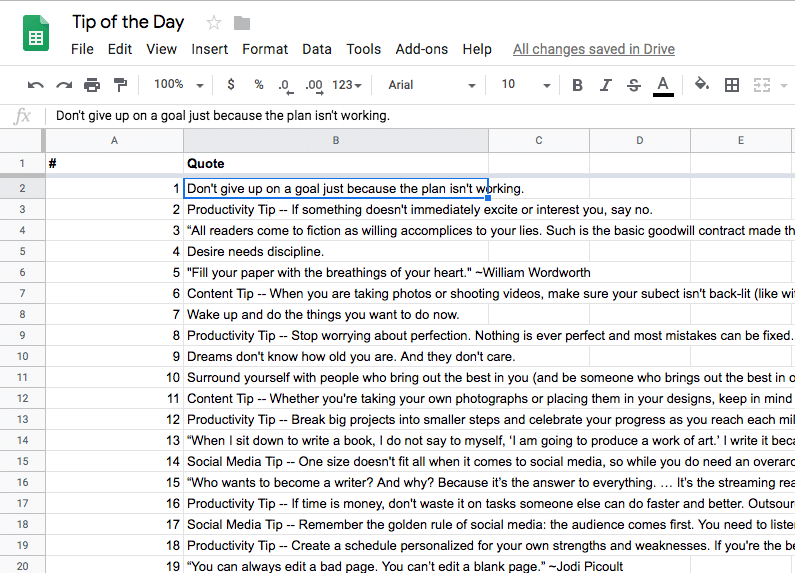 As long as you can go in and update your Google Sheet with new tips, quotes, or jokes, the sequence can last basically forever. Or at least as long as you want it to. If you do decide to end it, make sure you close it off by adding in as a quote something that let’s people know that it’s over. Ending it simply because you let the quotes run out can feel abrupt to your readers. 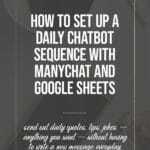 How might you use this type of daily chatbot sequence with ManyChat? And if you don’t want to send the messages out daily — maybe you want monthly tips or something like that? That’s easy. Just change the frequency of that message inside your sequence from 1 Day (which is the default setting) to 7 Days or 30 Days or whatever frequency you want. PSST — are you short on time and don’t really feel up to going through all these steps on your own? No problem!! You can purchase this entire template, complete with the pre-built growth tool opt-in, for just $45. Just install the template, add your own Google Sheet of quotes, and you’re good to go.